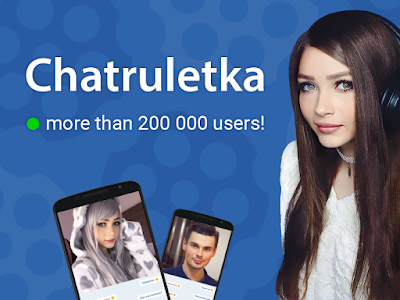 Chatruletka is a popular service that allows you to have a video chat with people all around the world absolutely for free and without any registration required. Our videochat is the largest one in runet, every day it’s visited by over 200 thousand users. 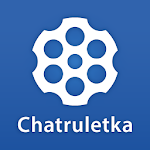 Using chatroulette you can chat with girls and guys from Russia, Ukraine, Belarus, and other CIS countries. The service is convenient and really free. To use this videochat you don’t need to go through a tiring registration process, create an account, or pay for service. All you need is downloading the app and tapping Start button! A randomly picked interlocutor will join a chat with you. If your microphone malfunctions, you can always use a text chat located next to the video chat box. By the way, the video chat box can change its size, for this, you just need to rotate your phone or tablet or tap the interlocutor’s video. Why would you need an anonymous videochat? This is an amazing possibility to talk to amazing people all around the world, find interesting interlocutors, declare yourself, and maybe meet your love! Getting acquainted with a girl or guy - easily. 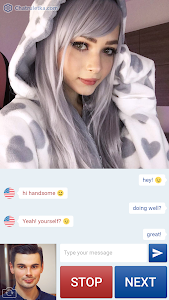 If you’re shy, not doing well in making new acquaintances, or don’t really like starting a conversation, you will definitely like the anonymous chatroulette. With it, you don’t need to find a way to introduce yourself - all you need is tapping the button to join one of the chat rooms. 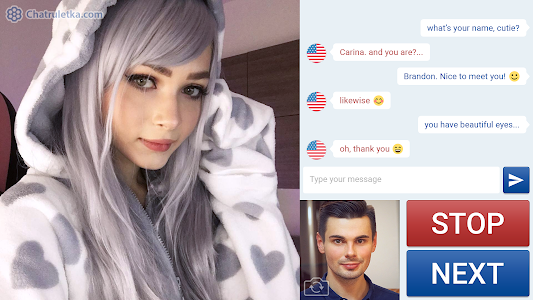 You can be creative and make yourself unforgettable in the videochat: wear a bright t-shirt, pick your favourite book or your cat. Those tiny details are a great way to hook your interlocutor. If you don’t like your random chat interlocutor, you can easily, without giving long explanations, switch to another one: just tap the Next button. Browse between the chat rooms until you find someone really special to chat with! Many users in our random chat like to express themselves: they read poems and sing songs to their interlocutors, play various music instruments, show magic tricks, etc. You can occasionally encounter a great show performed by an absolutely unknown person. If you are in need to talk to someone, express yourself, pour out your heart, and be sure none of your acquaintances knows about that, you may also find the videochat roulette useful. You may tell as much as you want: neither your name, no locality, nothing is disclosed and won’t uncover your anonymity. For you to be able to use chatroulette with comfort, we have a 24-hour moderation. If your interlocutor behaves offensively, is rude to you, or does something else that abuses you, you can always complain to a moderator and such user will be blocked. Also, no one can see your personal data and break your anonymity, unless you choose to tell something about yourself to your interlocutor. Chat Roulette is an easy, comprehensive, and completely free way to get along with people all around the world! Similar to "Chatruletka – Video Chat"